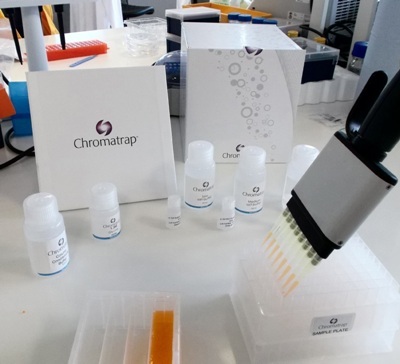 The Chromatrap® 96 high throughput ChIP microplate for qPCR is based on the novel spin-column ChIP technique. The kit contains 96 Protein-A or Protein-G based filters in one SLAS/ANSI standard microplate footprint device, along with sufficient buffers and reagents for enzymatic shearing of chromatin and up to 96 chromatin immunoprecipitation assay. For the first time this kit allows you to perform up to 96 ChIP assays through to qPCR analysis in less than one working day. Large, reliable data sets for qPCR can be collected efficiently, enabling widespread effects to be studied across multiple samples and cell types; all carried out simultaneously. Without the use of magnetic or agarose beads eliminates non specific background and reduced manual handling error and sample loss. Optimised elution buffer chemistry allows samples to be analysed directly in qPCR without the need for DNA clean up, further reducing sample loss. This kit is designed for use as qPCR as the downstream process only and has a wide dynamic range suitable for low chromatin loadings (50ng-7000ng). Optimised for 1000ng sample sizes allowing for better results from small sample sizes and provides greater flexibility thus more IP assays can be performed from just one sample. This kit does not include control antibodies or PCR primers.